in upstate New York. I have 9.6 acres of land. My life is getting better. I hope you haven’t forgotten about me because everytime I wakeup to this home I have you to thank. Our clients were surprised to learn that a family relative died and left her entire estate, valued in excess of $2,000,000 to two distant relatives. The deceased had suffered from dementia and paranoid schizophrenia for a long time. 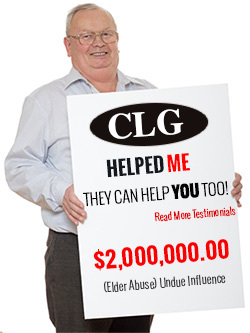 We represented the potential heirs in a claim of Undue Influence and Elder Abuse. We recovered over $750,000 after estate taxes.